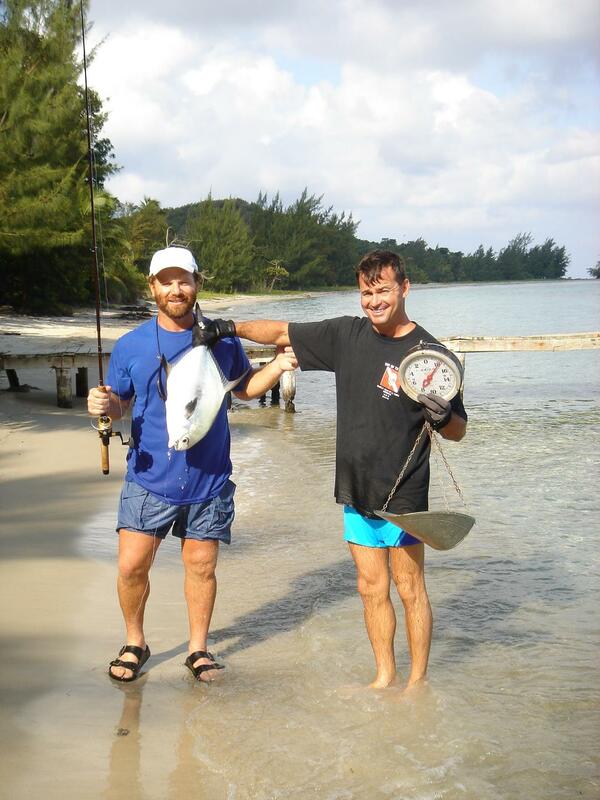 Guanaja’s waters are plentiful with Bonefish and Permit for the ardent Angler. Angler’s are successful with both cast or fly rigs and can either fish from a boat or wade in the flats. 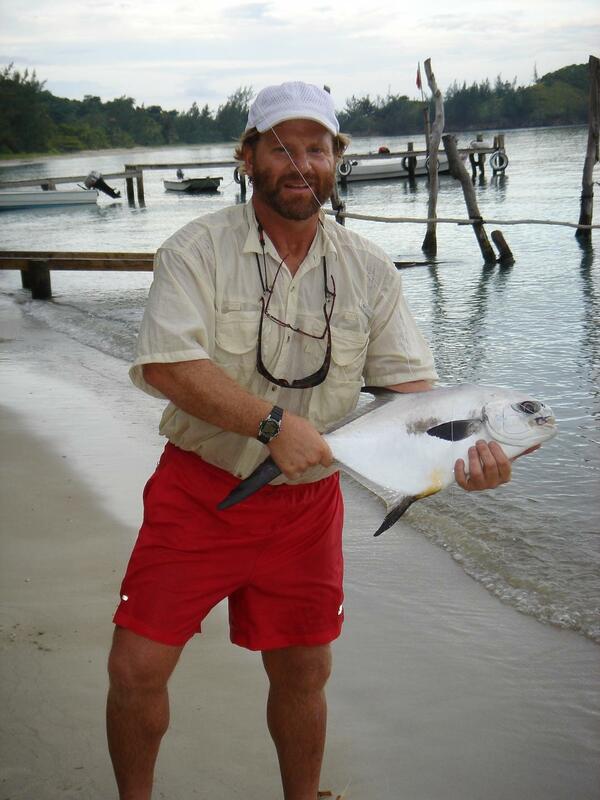 Average size Bone fish are between 3-6 lb and Permit average between 4-12 lb. SPIN TACKLE: We provide complete spinning tackle or you can bring your own. Most light spinning or saltwater tackle will suffice however, extra light spin casting is recommended with 6 lb to 12 lb test line rigged with 25 lb test wire leaders are the most commonly used by our anglers. For light spin casting we have had lots of luck using crippled minnow lures (metallic colors), spoons w/ #3-6 sizes, live bait rigs using Fiddler crabs and live minnows. Many guests have had great results with Feather jigs, Marabou (yellow and White). Hooks from #3-#7 short shank for live bait work wonders. FLY FISHING: We do not provide Fly Fishing equipment. # 7 to # 9 rods do very well with 9 lb -12 lb line weight. Excellent results have been achieved using large saltwater Steamers which included Mylar strips, Muddlers, Bonefish Shrimp type flies and Popping Crabs. DEEP SEA FISHING: Full day and half day charters aboard completely rigged vessels troll for Sailfish, Marlin, Wahoo, Cero, Barracuda and Mahi Mahi. 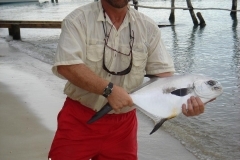 Charters are all inclusive: Boat, Captain, poles and rigging, bait, tackle and lunch are provided. 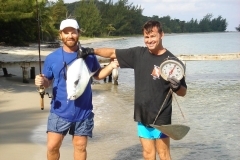 Bring you catch back to the resort and our cook will prepare them for dinner. **Prices for Deep Sea Fishing are available upon request. SURF AND DOCK FISHING: At The End of the World are always available at all times. Commonly caught fish are Snapper, Pompano, Jacks and Grouper. Just tell the cook in advance.